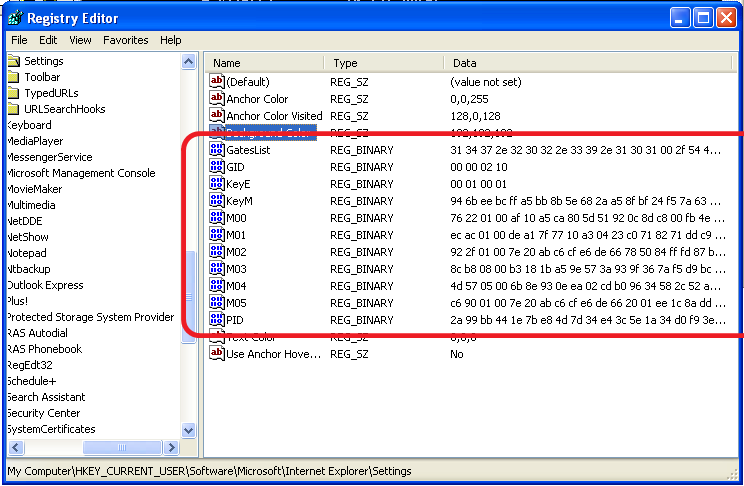 This is an in-depth analysis of a Trojan called Clampi or otherwise known as Ilomo or Clomp. Clampi got quite a bit of press coverage lately. As always, most press reports are not really technically correct and we look at Clampi here from a technical point of view. The Clampi malware is one of the hardest malware to analyse. Even in the scope of the high-end of sophistication with well-known Trojans such as Mebroot, Silentbanker, Zeus, … Clampi is by far the hardest to analyse. Reasons for this are the multiple VMProtect protection, extensive use of encryption and unique design approaches such as the subversion of the registry to store the malicious files. No payload will ever be written to the harddrive. Clampi will download the encrypted files and store them in an encrypted format on the harddrive. The way Clampi is setup; it is a very robust Trojan, both in terms of resilience and resistance. It can talk to numerous C&C servers and any payload can be deployed, so Clampi can be used for pretty much every malicious purpose. Even though Clampi is incredibly sophisticated, there is still room for improvements and we believe there will be soon new variants of Clampi available that are much, much harder to detect as they “fix” the existing limitations. However Clampi is not a new trojan. It is known since 2007 and the security industry didn’t really grasp the full scale of its badness due to the fact that nobody really knew what it is doing exactly for the reasons mentioned above. We hope we can shed a bit of light into the operation of Clampi and help strengthen the “good” side. Please note that this public blog doesn’t contain all the technical information and we have an in-depth report of Clampi available for interested parties. Just send an email to labs@trustdefender.com. The payload is added to HKEY_CURRENT_USER Software MicrosoftWindowsCurrentVersionRun so that it runs with every start. However it is noted that it will only start for the current user. Clampi will not add this registry to HKLM! Security researchers rely more and more on automated analysis of malware samples; however this automated analysis is still pretty limited as they don’t show anything in this particular case. 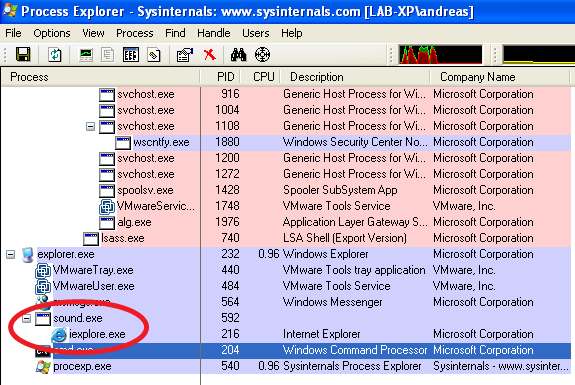 Virustotal didn’t say anything and Anubis only noted that sound.exe started the Internet Explorer. While this is not suspicious at all, it already hints to one evasion technique of Clampi which we will analyse in more detail later. First of all, Clampi uses a number of evasion techniques that are quite extraordinary and special. Clampi breaks its functionality up into various parts and is using sophisticated techniques to perform its job and to stay undetected. When the payload starts, it will automatically start an instance of the Internet Explorer as well. First of all, the iexplore.exe with PID 216 runs in suspended mode, which means that it is not accessible at all. This Internet Explorer process is responsible for all outgoing internet communication to the Clampi C&C server. This was clearly also done to evade Personal Firewalls as they would see an internet request from the legitimate Internet Explorer which is obviously allowed. This also shows a limitation of the Clampi C&C server. Once you stop or kill the Internet Explorer Process, Clampi cannot talk to its C&C anymore and is basically defeated. There is actually another module, which gets encrypted only in memory. Now these modules are all VMProtect protected – except M04 which is an exact copy of psexec.exe from sysinternals. We will later come to this in a bit more detail. more detaila are available in the in-depth report. And with these hook, Clampi has access to all internet communication even if it is SSL encrypted. However these hooks will only installed for the Internet Explorer and NOT for Chrome of Firefox. available in the in-depth report. TrustDefender will automatically protect all its customers against Clampi in several ways. Firstly, for our enterprise customers, communication to the C&C servers is cut-off automatically due to our Secure Lockdown feature as part of the client policies. Secondly, TrustDefender will identify the unknown process that starts the Internet Explorer and will prevent it from doing any harm. Thirdly, TrustDefender will pickup the Windows Hooks and automatically resolves them so that the Internet Session is encapsulated from Clampi. 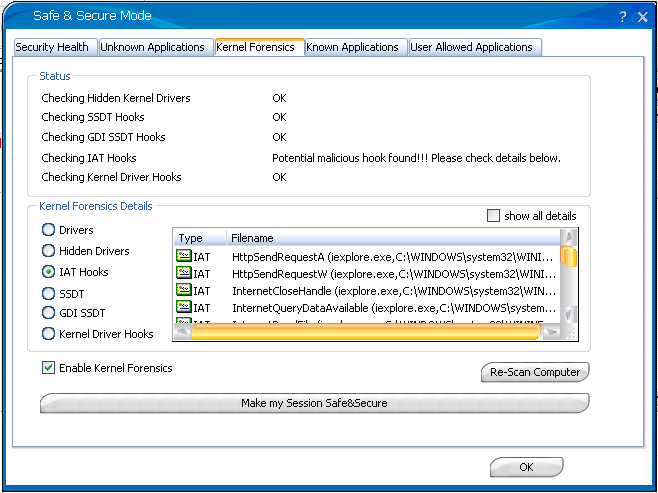 And fourthly, the Kernel Forensics Engine makes sure that the transaction is safe. The following screenshot shows the detection of Clampi. Please note that in the OEM edition, this screen won’t appear and the information is handled by the Enterprise Server. The detection is pretty easy if you have access to the machine. Simply check for the existence the Clampi Registry keys which are described in the Registry chapter before. Check for existence HKEY_CURRENT_USERSoftwareMicrosoftInternet ExplorerSettingGatesList and if you find this, you are infected. Furthermore, check for a process with one of the following names (svchosts.exe, taskmon.exe, rundll.exe, service.exe, sound.exe, upnpsvc.exe, lsas.exe, logon.exe, helper.exe, event.exe, dumpreport.exe, msiexeca.exe) and check whether they have launched the Internet Explorer with procexp from sysinternals. HOWEVER, don’t log in to infected workstations using domain administrator credentials as this is how it spreads (using psexec). Clampi can be fairly easily removed from the system without too much problem. However unlike Mebroot/Torpig, it will not store the stolen credentials on the local machine, so it’s not possible to detect exactly what has been stolen. 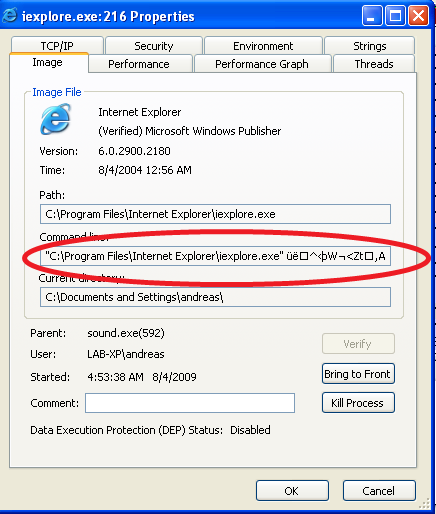 Kill the sound.exe process (or whatever the filename is) that launches the Internet Explorer. Restart the computer and Clampi should be removed. Further information can be obtained from TrustDefender at labs@trustdefender.com as well as the in-depth report of Clampi.